Wagner out-thinks tactical master in stunning Town display! We definitely aren’t safe yet, but this point was massive. On Sunday, Town did something that hasn’t been done this season in the Premier League – stop the Champions from scoring at home. And in all honesty, we managed it quite comfortably. We might’ve even won, had Hadergjonaj been more composed, or the late Malone chance fell to someone more natural in front of goal. But, before the game, Town would’ve snatched that point, and it’s yet another blow for the relegation rivals. 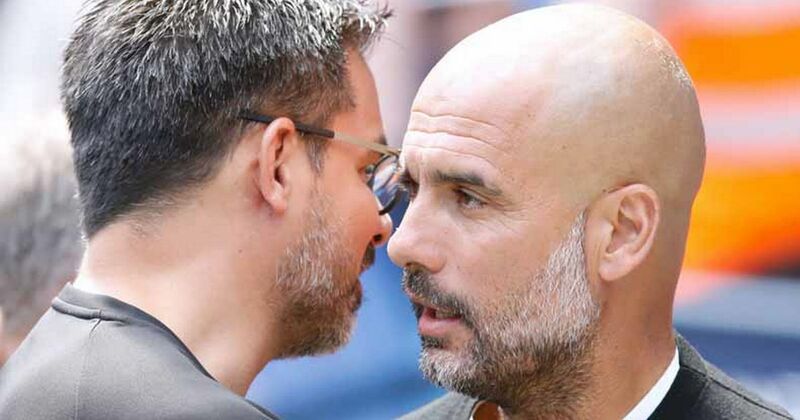 The Terrier’s desire, fitness, and fighting spirit was there in abundance, but there was one man that masterminded this performance, and he out-thought one of the greatest tacticians of all time, Pep Guardiola. If one criticism could’ve been pointed at Wagner over the course of this season it would be his stubbornness and lack of will to shake things up. He has largely stuck to his favoured 4-2-3-1 formation, which was so successful in getting us promoted last season, and in the games we have won this season, this shape has been positive. However, particularly against the top teams, Town have probably been too negative, and paid the opponents too much respect. There is a pride about our defensive work, shown in our outstanding 10 clean sheets, but at times we’ve definitely sacrificed our creativity and flair in doing so. Even in the games when we’ve had plenty of the ball (e.g. Watford, Swansea, Everton), there has been very few clear-cut chances created. No side has scored less goals (=27 with Stoke) than Town this season. But against Manchester City, surely Town’s toughest task, Wagner changed it all. He made bold defensive changes to switch to a 5-3-2 formation, with out-of-favour full-backs Smith and Löwe coming in, allowing the outstanding Kongolo to drop into a third centre-back position. Furthermore, this allowed recently crowned Young Player of the Year Hadergjonaj to push into midfield, a position he played very well at Old Trafford. Despite these changes, the most striking difference was Wagner’s decision to play without any out-and-out wingers for the first time this season. Who can blame him? The wingers have been the weak-links, and despite us having two more-than-capable strikers, they have failed to create chances for them regularly. In the revised formation at the Etihad, the full-backs provided the width, whilst still maintaining defensive solidity. On the face of it, fans could’ve been forgiven for suggesting Wagner had gone too defensive, selecting six out-and-out defenders. It was quite the opposite though, as particularly in the first half, Town pressed City high, won the ball in good areas, and created chances, troubling the Champions like they hadn’t been troubled often this season. The endless work on the training ground was obvious, as Town were so organised and held their shape impeccably in tough conditions, and almost broke through the hosts with a well-worked set piece, which resulted in Hadergjonaj firing straight at Ederson. Pritchard had another shot excellently saved by the Brazilian, who was called into action in injury-time to deny Malone. City, who boasted 102 league goals, were largely limited to shots from distance, with Lössl making a few routine saves, the best coming in the early stages from Silva. Huddersfield Town have managed 703 tackles in this seasons Premier League. That’s 54 more than any other side. Looking back over Wagner’s tenure as Town boss, when it matters, he seems to get it tactically spot-on. From his controversial team choices after securing the play-offs last year, to his plans against Sheffield Wednesday and Reading, to his attacking set-up’s in the early stages of this season, and more defensive performances against both Manchester clubs. Although Town will know more after Swansea and Southampton clash on Tuesday, a similar set-up would probably be favoured against Chelsea, as Town look to mathematically secure a miracle first season survival. I’m sure there will be changes in selection, as is the way of Wagner, but one thing is for sure, tactically he will do everything he can to get us over the line. Previous The Vital Game: Can Town break down Palace?